These are some of the best podcasts we’ve ever done. Andrew O’Neill is joined by a trio of experts to look at three aspects of metal culture. In podcast 14 he and Debi Linton explore the Venn diagram that links palaeontology with metal fans. Yep, dinosaurs and headbanging in one. In podcast 15, which has been put out essentially unedited he joins sociologist Titus Hjelm for an exploration of heavy metal culture, across Scandinavia and beyond. This is a meeting of titanic metal minds, and it would have been a crime to chop any of it out. In podcast 16 he talks ancient metal with Ruth Fillery-Travis, archaeometallurgist, and finds out why its more fun to work on Roman slags than exciting-looking swords. This month we’ve flipped Bright Club upside-down, with six regular audience members taking to the stage for the first time to find the funny in their jobs, hobbies and expertise. They’ve listened for too long – now THEY’RE in charge! Elise Bramich – Obsessed by size. Sorry boys. Benji Fox – Bright Club soundman turned audio intellectual. 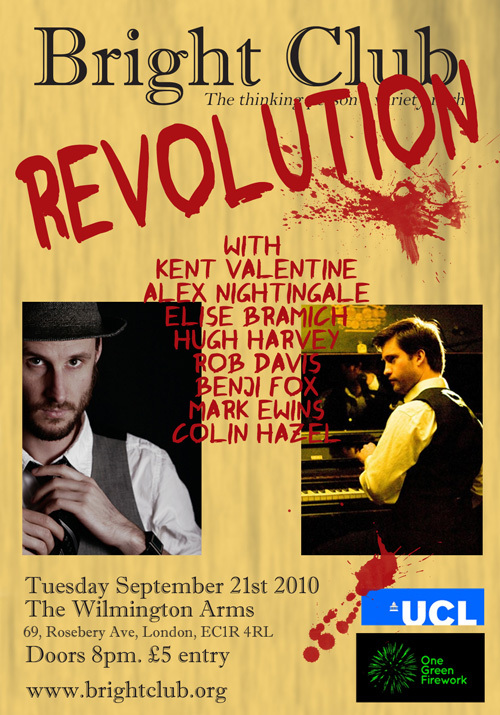 So get your behind down to the Wilmington Arms on September 21st. 8pm. £5 of your hard-earned cash! 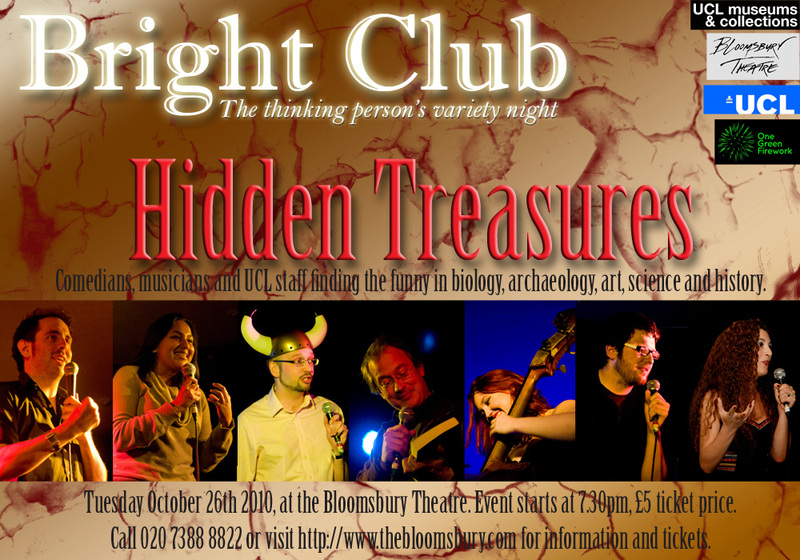 A big announcement – Bright Club: Hidden Treasures, October 26th. The biggest Bright Club ever. On October 26th this year. The quicker you buy, the better your seat! The lovely Food podcasts with the beautiful Bec Hill are now over. She went out with a real bang, sharing jam-based metaphors with neuroscientist Becky Lawson. Our new comedy podcaster is Andrew O’Neill, who will be taking on four metal-themed podcasts. First up is Prof David McAlpine, who knows all about hearing loss due to loud noises. I wonder what that’s got to do with metal. Oh. Links are up top, after you click ‘Podcasts’. Nick Doody (http://twitter.com/nickdoody), who tells jokes that make a difference. Daniel White, Sustainability Officer at the London Borough of Camden, talking about saving energy in the home. 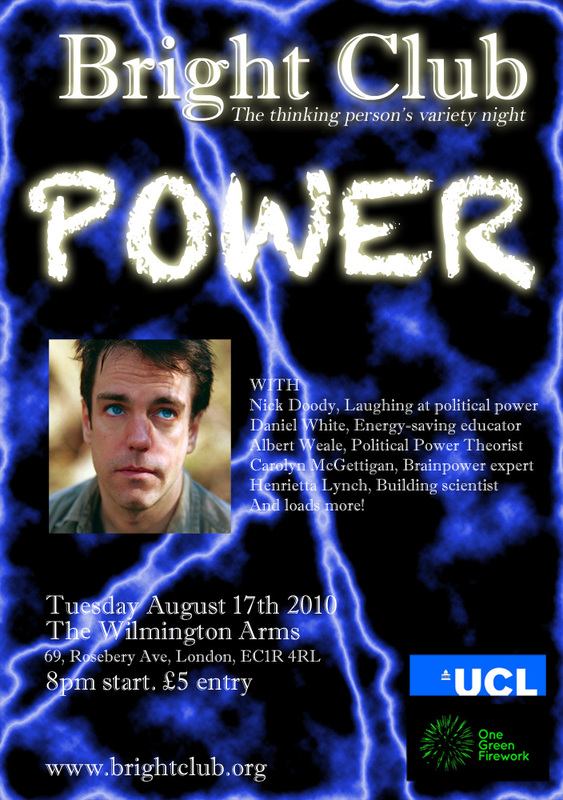 Albert Weale, Professor in political theory and expert on government power. Carolyn McGettigan, Neuroscientist who knows about brain power and brain training. Henrietta Lynch, building scientist, lighting designer, carbon saver, talking about the design of the built environment. We are back with two events in Feb 2018! 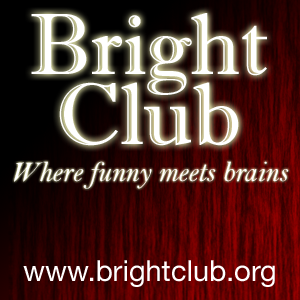 Bishop Grosseteste University – Bright Club Lincoln.